If Harsh Chhaya wanted to take an idea from the award-winning Marathi film Ventilator, he should have simply remade it, instead of turning into a broad, mostly witless, insensitive farce. When Jeetendra (Manoj Pahwa) gets a midnight call about his brother’s hospitalization, he drags his wife (Seema Pahwa) and two kids (Sanah Kapur, Mayur More) to Mumbai supposedly to help, but actually to keep track of their family’s flat that the brother had been occupying. He tries to prevent the other two brothers and a sister from coming too, and makes much of spending on airfare. The younger brother Ravindra (Vinay Pathak), cancels work meetings and takes his wife (Suneeta Sengupta) and son to Mumbai, more to keep up appearances. The hysterical sister Lalli (Dolly Ahluwalia) lands up too and sends the hospital staff into a tizzy. 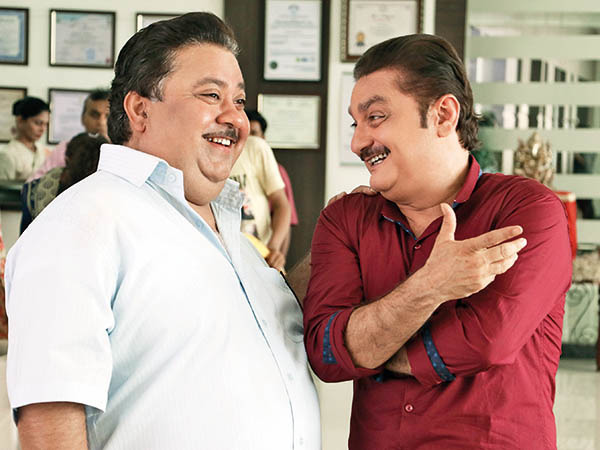 The comatose brother’s wife (Alka Amin) is binge-eating out of stress and his son, Alok (Vicky Arora) trying to make sense of the chaos of his “item” family. It’s clear right from the start that nobody really cares about the ill brother, but Jeetu’s hypocrisy is gold-plated. Some situations are believable—like first timers to Mumbai wanting to see a star’s bungalow on the way to the hospital, go sightseeing, or try to fix a matrimonial alliance in the hospital waiting area, but mostly the situations are either clichéd or exaggerated. Even the talented cast hams—only Alka Amin manages to pitch her performance right. Boys wanting to check out a dance bar is somewhat plausible, but which girl would be stupid enough to think that a lowlife chat buddy Rokky Dilwala (Prathamesh Parab) could make her a “heroine” in films; too much time is wasted on this track. What the family goes through is tragic—not knowing over a tense two weeks, if the brother will survive or die; so the humour should have been dark and tinged with sorrow, not so obviously over the top. It is admittedly a tough balance, that Ventilator achieved. The worst thing a comedy can do is poke the viewer in the eye, and shout, “Look how funny this is!” Most of the time, it isn’t!